Morton were crowned Scottish League One champions as they recorded a 3-1 come-from-behind victory over 10-man Peterhead. The Ton fell behind but Scott Ross' dismissal proved crucial as the hosts rallied, with Michael Miller and Mark Russell both scoring in four first-half minutes and Declan McManus adding to the tally late on. The home side's promotion party did not look like materialising when Gary McDonald headed in Steven Noble's 17th-minute corner at the back post. However, just four minutes later, last man Ross saw red for hauling down McManus, with Peter MacDonald rattling the post from the resulting free-kick. 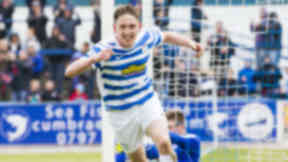 Morton levelled after 36 minutes as Michael Miller's 25-yard effort arrowed into the bottom corner of the net and they went ahead shortly afterwards, Mark Russell's long-range effort deceiving Graeme Smith to find the net. McManus made sure of the three points, and the title, in the latter stages as he rounded Smith before tapping home. Ten-man Forfar will go into the play-offs after their Scottish League One title hopes were extinguished when they slipped to a 3-1 loss against Ayr. The Loons needed Morton to drop points and turn around a deficit in goal difference to finish at the summit, but the Ton's win, coupled with their loss, saw them drop to third in the final standings. Things had started perfectly for the hosts and Forfar were top of the table after seven minutes when Dale Hilson broke the deadlock with a penalty he had won himself. However, Jon-Paul McGovern levelled from the spot and Michael Dunlop, who had been booked when conceding that penalty, picked up another caution only two minutes later to receive his marching orders. Jordan Preston headed the visitors in front just before the break and Preston then teed-up Alan Forrest to extend their lead after the hour. Stranraer had to settle for the League One play-offs despite a 3-1 win at Brechin as Morton claimed the title. The Blues won the game thanks to Stephen Stirling's effort and two Willie Gibson penalties but Morton's 3-1 win at Peterhead saw them crowned champions. Stirling put his side ahead in the 20th minute when he converted Gibson's pass with a thumping finish but the lead was short-lived as Ryan Ferguson got on the end of Callum Tipping's long ball two minutes later. The visitors restored their lead when Gibson struck his first from the spot after he was fouled in the area. The game was made safe 14 minutes from time when Gibson converted his second penalty of the afternoon after a handball from Darren McCormack, which earned the City defender an early bath. Stenhousemuir conceded two goals in the final two minutes to lose 3-2 at bottom club Stirling and are consigned to the relegation play-off. The visitors required a victory to give themselves a chance of definite safety and appeared on course as they led 2-1 with two minutes remaining, but Ayr's 3-1 win at Forfar meant the visitors would have had to play-off anyway. Stirling, already relegated, fell behind to Colin McMenamin's 13th-minute header, but equalised through Gordon Smith six minutes later. Stenhousemuir striker Paul McMullan's 36th-minute shot hit the crossbar, but the visitors gave themselves hope when substitute Craig Sutherland put them ahead with 14 minutes remaining. Stirling looked to be heading for a 13th home league defeat of the season, but Ross Forsyth fired an 89th-minute equaliser and in stoppage-time striker Andrew Stirling curled home the winner. Airdrie finished a point off the play-off places in Scottish League One following a last-gasp 3-2 win against Dunfermline. Rohan Ferguson did well to keep out a superb strike from David Hopkirk in the 21st minute and the Airdrie goalkeeper had to be alert again to tip over a Gregor Buchanan header. The Pars did open the scoring in the 33rd minute as Finn Graham's cross was finished neatly by Andy Geggan. Airdrie levelled from their first noteworthy chance of the first half as Jordan Morton headed home from Liam Lindsay's cross in injury time. And they were ahead in the opening seconds of the second half as Rob McHugh nodded in Scott Fraser's free-kick. The visitors were back on level terms just before the hour when Josh Falkingham collected a pass from Geggan and found the top-left corner. McHugh had already fired over the crossbar when he snatched a last-gasp winner, Jack McCue playing the ball into his path and the striker finishing confidently.